Hi to all you lovely calico girls. Hello my fellow calicos! Let\'s all pause for a moment and roll around in our superiority. That\'s good. What do your calico tails looks like? Anyone got pictures? There is a photo of my tail on my contest page, in the crazy tail category: http://www.catster.com/show/vote_pet.php?i=202784 ... see how pretty it is?!? Ohh Syd your tail is so cute.....have are you doing? Have you retained your girlish figure yet? Hi Girls! 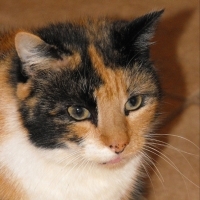 I\'m a Calico too....Mom had a Calico before me, \"Mata Hari\", and when Mata Hari died at 15 years old, Mom thought she would never be able to love another cat in the same way. But that was untill I came along! We Calicos really know how to heal a wounded heart, don\'t we? Welcome Patches!! *giggles* Yes I believe we could melt hearts if needed!! Sydney you look so fetive!!! Why thankyou Sydney. heehee. Sheeeesz sounds as if I am talking to myself!! MOL!! You gonna dress up? Surprised Pokey hasnt yet.